Light-hearted and cheerful, with toe-tapping songs, and a relevant message woven in. “You can’t stop the beat” and you definitely can’t stop the UK touring cast of Hairspray. It’s at Mayflower Theatre until January 27th. 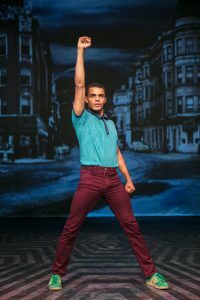 This crowd-pleasing musical tells the story of a teenager in 1960s Baltimore who just wants to dance on the Corny Collins Show, a TV dance program based loosely on the real-life Buddy Deane Show. Rebecca Mendoza makes her professional debut as the iconic main character Tracy Turnblad, a role she fills with so much warmth and spirit before she’s even finished the opening number. Her extremely convincing portrayal of a strong-willed and lovestruck girl forms the backbone of the story. Cheerful and light-hearted, Hairspray doesn’t take itself too seriously, whilst also having a storyline revolving around racial segregation and body-issues. No deep emotional depths were reached, Hairspray is too carefree for that, but when the after-show thrill had gone the audience were left with some important (and worryingly relevant) things to ponder. Coming in to the theatre from a cold January evening outside, the musical is a very welcome up-beat and bright experience. The sets were simple, allowing the impressive dancers to shine without distraction, but also were innovative enough that the audience were transported to the Baltimore streets and high school gyms. This ranged from a ten-foot hairspray can in the final number, to the school gym being represented by two neon basketball hoops, and finally to the two ‘houses’ in the wings, belonging to Tracy and Penny. The set also allowed the band to be visible in some of the numbers, which is always a joy to see. The aforementioned dancing ensemble were extremely talented and tackled the complex choreography with ease – for a musical so heavily reliant on toe-tapping action, there wasn’t a weak link in the cast. Layton Williams particularly shone as Seaweed, a classmate Tracy befriends in detention, his playful arrogance mixing with his acceptance of segregation perfectly. Williams most recently played Angel in the UK Tour of Rent, but it was his background as Billy Elliot that was evident as he leapt around the stage, enthralling the audience and obviously having a fantastic time of it. You also couldn’t help but root for the progressive TV host Corny Collins, played with showman charm by Jon Tsouras, as he fought against the rigid producer Velma Von Tussle. The biggest laughs of the evening were owed to Matt Rixon and Norman Pace, who played Tracy’s parents with comedic genius, even (especially) when a prop failed them, and the audience ended up in hysterics. Their rendition of ‘You’re Timeless To Me’ played on some of the traditional pantomime dame gags, but was also incredibly heartfelt. As a general ensemble, the excitement of the cast definitely showed, and was passed on to the audience who gave a very enthusiastic standing ovation on curtain call. Hairspray is running at Mayflower Theatre until Saturday 27th January.